CHICAGO -- Ish Smith calmly sank a driving lay-up with 5.4 seconds to go to lift the Detroit Pistons to a 118-116 victory over the Chicago Bulls in front of a sold-out crowd of 21,289 fans at the United Center. Smith's Saturday night heroics came moments after Bulls star Zach LaVine drained a 26-foot triple to knot the score at 116-116. In the ensuing play, LaVine turned the ball over under pressure and Chicago fell to 0-2 to start the season. "It's an awful way to lose," LaVine told reporters after the tight contest. Detroit, which surged to a 2-0 start, got 15 points from Smith, but it was Blake Griffin who led the charge with 33 points. Reggie Jackson had 18 and six assists while Stanley Johnson and Andre Drummond nailed 10 apiece. Reggie Bullock added 16. Smith in unbelievable," said Griffin, a former cornerstone of the Los Angeles Clippers before being traded to the Pistons last February in a blockbuster deal. LaVine paced the Bulls with 33, hitting 12 -of-22 field goals, while Justin Holiday had 19 points, six rebounds and six assists. Cameron Payne, who started at point guard in lieu of the absent Kris Dunn (family matter), had 17 and four assists. Jabari Parker came off the bench with 13 and six boards. The Bulls hope to right the ship when they face the Mavericks in Dallas on Monday while the Pistons gun for a 3-0 start when they host the Philadelphia 76ers at home on Wednesday. 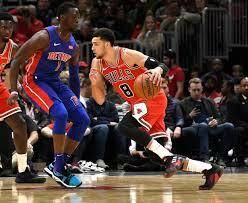 Zach LaVine's 33-point effort wasn't enough to save the Bulls from the Detroit Pistons, who won a close 118-116 decision at the United Center. Click here to view a list of other articles written by Taha Qureshi.